Hourt was Aki Ra’s wife, but you barely see her in Aki Ra’s Boys. She wasn’t too keen about being in the limelight – in one scene, she’s helping to clean some newly defused landmines. In another, she’s splashing around in a lake, having a ball with the kids, urging them to swim faster, jump higher, reach further. Everyone had a great time that day, inspired mainly, by Hourt’s infectious sense of fun. She told us she liked pushing her kids to do normal kid things. So what if you only have only one leg, one arm, or no eyes? Who says you can’t have a regular childhood? If Aki Ra was the face of the old Landmine Museum, Hourt was its beating heart. She was the one whose permission we had to seek whenever we wanted to spend extra time with Boreak or Vannak. The one who made sure that the meals were cooked, that the kids followed a routine, that they had a chance to play. She was barely older than the oldest children, but everyone called her “Mother”, this tiny woman with sparkling eyes and nerves of steel. Hard to believe she was just 25 when we first met. Hourt passed away last week. We do not know how, or why. No one seems to want to talk about it. We’re still struggling to understand, but perhaps it is enough that we know she is gone and Aki Ra and the kids are coping well. She’s gone, and the world feels like a darker place. 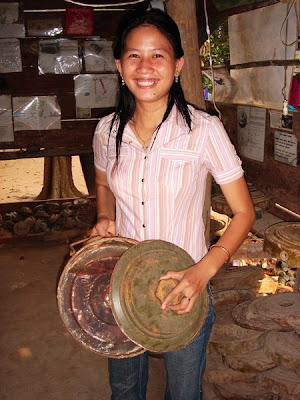 More updates from the Landmine Museum here.